That’s a very good question. It points to a larger problem with EHRs – one that most if not all providers complain about – which is the shifting of work from staff to providers. Sometimes this is in the name of efficiency. Why have the patient wait for the referral to be entered when the provider can just do it at the point of care? Why have the provider have to tell a staffer when he or she can do it real time? In many cases, this is a misguided attempt at efficiency. Although we can reduce the number of steps in a process, that’s not everything we look at when we map workflows. We also need to look at the cost of various people doing various tasks. It often doesn’t make sense for providers to do certain steps that EHR workflows are trying to force them to do. Other times this is in the name of patient safety. In its purest form, this makes sense. Having providers enter medication and laboratory and diagnostic orders can prevent transcription errors and allow them to acknowledge warnings and alerts. It’s a good use of some of the most expensive employee hours in the office. Unfortunately, that thinking has driven a lot of work upstream that organizations haven’t yet redistributed to where it is most appropriate. In the paper world, my referral process involved a single page flow sheet where I marked what to send in the referral bundle and who to send it to, along with a diagnosis. My medical assistant knew the short list of common referrals and where to send the packet. They managed that list of fax numbers and locations, not me. They knew whether to send the packet to the West Office for a Thursday appointment or to the South Office for anything else. Now that the referral workflow has been embedded into the provider workflow in my EHR, I’m supposed to manage those facts while I’m sitting in the room with the patient, because they system wants me to complete it before I move on. Of course, I could simply send an electronic task to my staff and ask them to do it, but that takes me out of my standard workflow as well. Don’t get me wrong, I’m excited about the ability to exchange secure messages with consultants and colleagues and have a copy added to the chart automatically, preventing phone tag and manual note-writing. But if it’s too complicated to find my key providers, I’m going to struggle. Two of the three systems I use on a regular basis have no way for the physician user to create their own address book or contacts list outside of the practice. One has a robust partial search where I can search a metropolitan area for a given physician. The other requires me to know the specific postal city associated with my target’s ZIP code. Honestly, I need to just search for Dr. X who is a cardiologist in the Chicago area. I have no idea whether they’re in Oak Park or Oak Brook and neither does my patient. These are usability issues as well as workflow issues. I can’t help but think that if vendors did more trialing of product with real-world physicians they would be better able to identify these things up front. We know from recent publications that vendors vary widely in how they perform usability testing (if at all) and how valid the results might be. I’ve been on some usability focus groups as a participant and it’s hard to manage bias and dominant behavior by some members. I’ve also supported usability testing for vendors and know that it’s hard to find knowledgeable participants who are willing to take time out of their busy schedules to participate in a usability study unless you throw ridiculous amounts of money at them. Even then the output varies widely. There are also physician psychology issues at play when work gets redistributed. Physicians realize how lean their offices run and can be reluctant to shift work to staff members that are struggling to get out of the office on time to pick up their children or tend to other obligations. Employers may be unwilling to pay overtime or to approve the hours needed to actually do the work, so someone has to take care of it and often that is the provider. There is also a perception that it’s quicker to just do the work yourself rather than ask someone else to do it. Couple this with a lack of time and energy to do the actual process improvement work needed to fix the underlying workflow issues and it’s a recipe for dissatisfaction all around. I’m working with a practice this week that has engaged me to do some workflow re-engineering, so this is in the center of my thoughts. I’ve worked with them before and the issues are complex. They only took about 20 percent of my advice last time, and although they initially made progress, ICD-10 and two software upgrades have caused some chaos. They’re one of the last independent practices in their community and does a mix of traditional primary care and somewhat fringe (read: cash only) services. The owner doesn’t really have a head for where primary care has been going in the last few years and I’m not sure he’s committed to doing what needs to be done to be successful. Frankly they’d be better off transitioning to a retainer or concierge-type practice, but they don’t want to do that either. It’s shaping up to be an interesting week and I can guarantee no boredom or downtime as I dig in with these folks. Not to mention they’re in one of the best cities in the US for barbecue, so I have nothing to complain about for dining choices this week. What’s your favorite BBQ locale? Email me. 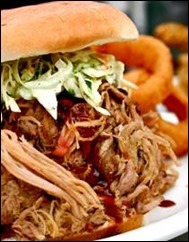 My favorite BBQ sandwiches live in coastal North Carolina. Our favorite place to hit on the way to the Outer Banks was Dixie Barbecue Pit (something like that) about 3 miles north of the bridge to Nags Head. Your article today makes me wonder if provider’s despair of their ever-evolving role is similar to the anguish we felt when we approached Dixie, our stomachs growling since the NC/VA line, only to find it had been replaced by a pizza joint. My heart really goes out to the men and women who signed up to save lives and now spend much of their energy saving time and avoiding fines. We eventually found lots of other places with our NC-style pulled pork with plenty of slaw; hopefully all this e-upheaval in medicine will result the same satisfaction. Beer, jazz, and BBQ … Detroit excels at them all. Too many brew pubs and restaurants to keep one’s figure, or liver, in youthful shape. Unfortunately it is much easier for a BBQ joint, or brewery, or band, to keep focused on what they do well than any health care software company. Regardless of origin, healthcare companies have to ‘grow or die’, and so all of them slide towards mediocrity regardless of the original greatness they once had. I think that is the ultimate reason why cloud based health care software makes the best sense in the long run. Since one workflow doesn’t fit all, why bother? Just subscribe to the modules one needs for one’s own practice, and bleep the rest.